Most of these Thai recipes were taught to me by my mother-in-law, who happens to be an expert when it comes to Thai home cooking (my wife is Thai). She doesn’t use any measurements or recipes that are written down on paper, but she rather throws in every ingredient using her experience, while taste testing everything until it’s perfect – and she’s really good at it. So when I decided to start recording and documenting some of her recipes, it was sort of just a matter of estimating how much of everything she used in her cooking style, and writing them down to have the measurements that we could follow. Thai food is very much a “taste based” cuisine. Taste testing is an extremely essential step in cooking Thai food. Even on the streets of Thailand when you order green papaya salad they occasionally will ask you to taste test it to make sure it’s alright to your liking before spooning it into a bag to go. Also, knowing how sour, sweet, spicy, and salty you want your food, getting a feel for balancing out the flavors in each Thai dish, is another important part of cooking Thai. The ingredients I’ve listed in all of these Thai recipes is a loose guide – it’s the amount I used in my recipe – but due to both different ingredients in different places and personal tastes, flavors and strengths may vary (as in 1 lime in Thailand might be more sour than 1 lime in the US). So I urge you to follow these Thai recipes, but also to taste test a lot until you have the perfect combination of ingredients. Before coming to Thailand, I used to cook frequently, experimenting with recipes from all sorts of different cuisines from around the world. I would often visit the Asian supermarket in the United States, purchase the ingredients I needed to test out Thai recipes, and then devour everything I would prepare. 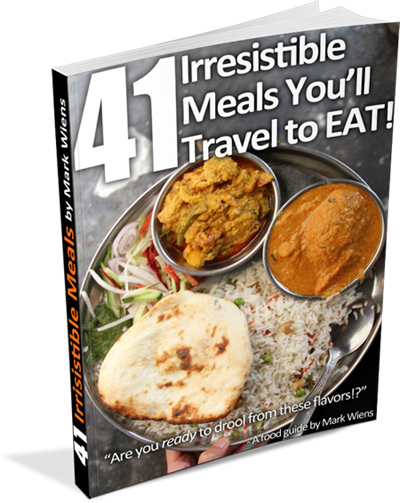 But I learned a lot, and it increased my desire to travel to Thailand with a main focus on eating. When I moved to Thailand, back in early 2009, I just couldn’t believe my eyes (and stomach) at how much glorious food there was everywhere I looked. Dwight and I would often go on extreme Thai street food missions, eating plate after plate of khao moo daeng and pad kra pao, slurping down bowls of boat noodles, and munching on skewers of moo ping. For years I lived in just a single room studio apartment, and I had little opportunity to cook. Luckily, the street food and best restaurants in Bangkok held me over. Life moves forward, and in 2013 I married Ying, my beautiful wife. Both Ying and her mother are expert home Thai chefs. Being from Krabi, in the south of Thailand, much of what we eat at home is southern Thai food. But that being said, my mother in law has the full spectrum of Thai recipes packed into her head. Getting married meant moving into a house, and having a house meant having a kitchen, and having a kitchen meant home-cooked food! I have to be honest that I am spoiled and come home just about everyday with amazing home cooked Thai food waiting for me. But I also do love to cook, and having a kitchen, I am now able to, with the help of Ying and her mother, cook some popular Thai street foods, and write these recipes down for us all to enjoy. I’m hoping that through the recipes shared here, you’ll be able to taste the authentic, bold, and exciting flavors of Thai street food at your home. Are you ready to start cooking Thai food? Although you’ll find an archive of all the Thai recipes on Eating Thai Food above, I’ve made a list below of my personal favorite Thai dishes to eat and cook. Many of these are all typical Thai dishes, using common Thai ingredients, and many are eaten on a daily basis in Thailand (and they’re incredibly delicious). A choice of meat, stir fried with lots of chilies, garlic, and a handful of fresh Thai holy basil, all scooped over rice, and with an optional fried egg on the side. 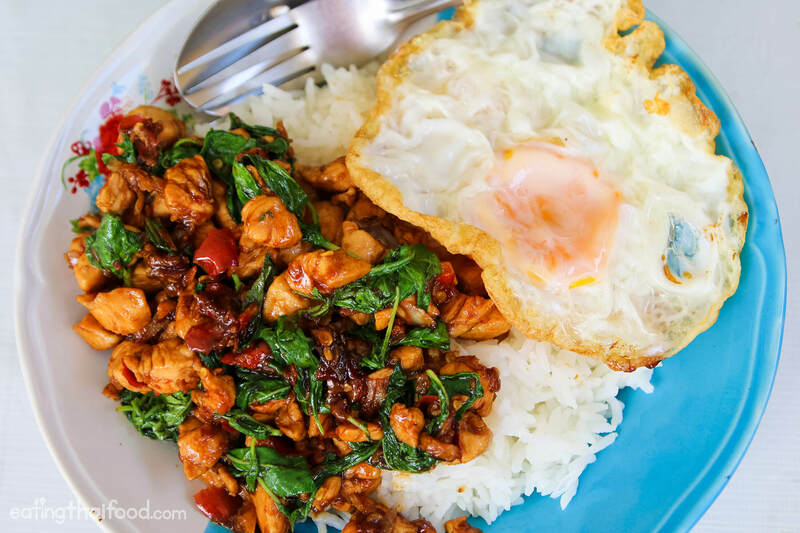 Pad kra pao is one of Thailand’s most beloved street food dishes. 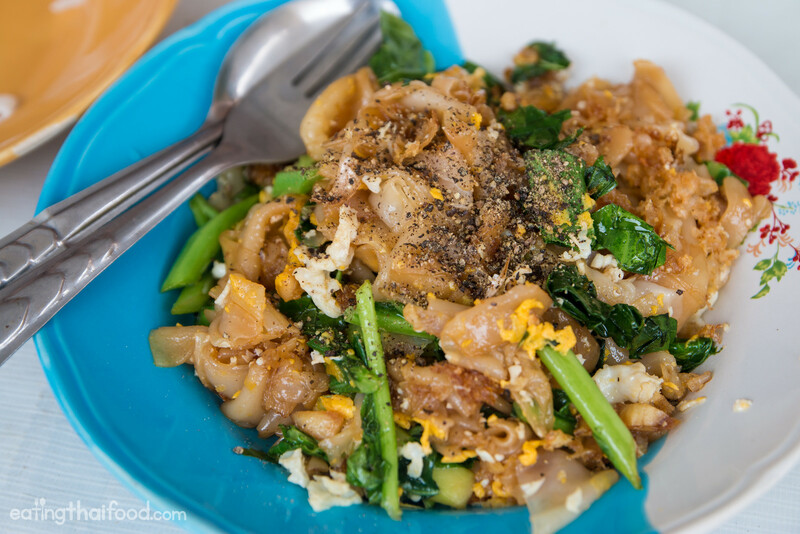 Along with Pad Thai, Pad See Ew is a giant in the fried noodle section of Thai cuisine. This recipe uses wide rice noodles, cooked with Chinese broccoli, meat, egg, and seasoned with light and dark soy sauce and a sprinkle of pepper. Known in Thai as a kai jeow moo sab (Minced pork omelet (ไข่เจียวหมูสับ), this is one of the most common and tasty Thai street food dishes – it’s often one of those dishes that’s ordered to complete a full Thai style stir fried meal – and something everyone loves. The egg is beat with a fork so it gets nice and fluffy, some minced pork and a splash of soy sauce are added, and it’s then fried in a wok with lots of oil. A Thai omelet is incredibly tasty, and you can replicate this Thai street food classic at home easily. Another popular Thai street food dish is fried rice, normally made with shrimp, a few small vegetables, and of course rice. 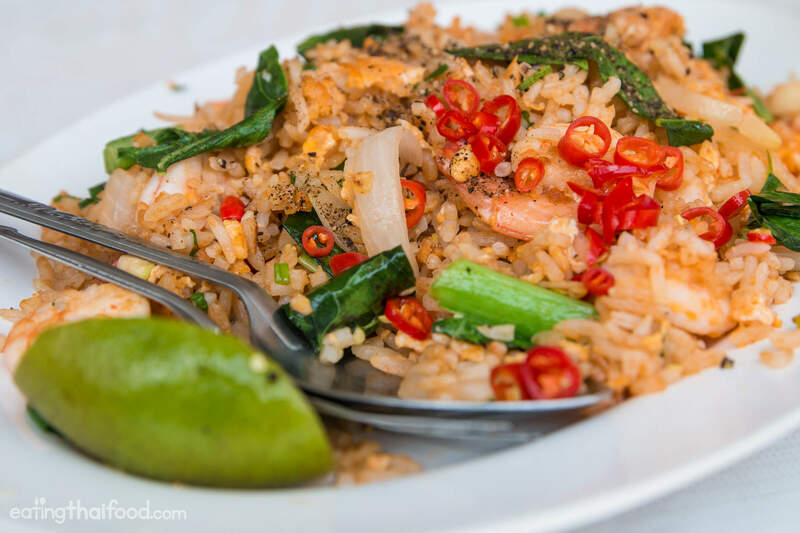 One of the best things about a plate of Thai fried rice is the prik nam pla, or Thai fish sauce mixed with chilies, that accompanies every plate. 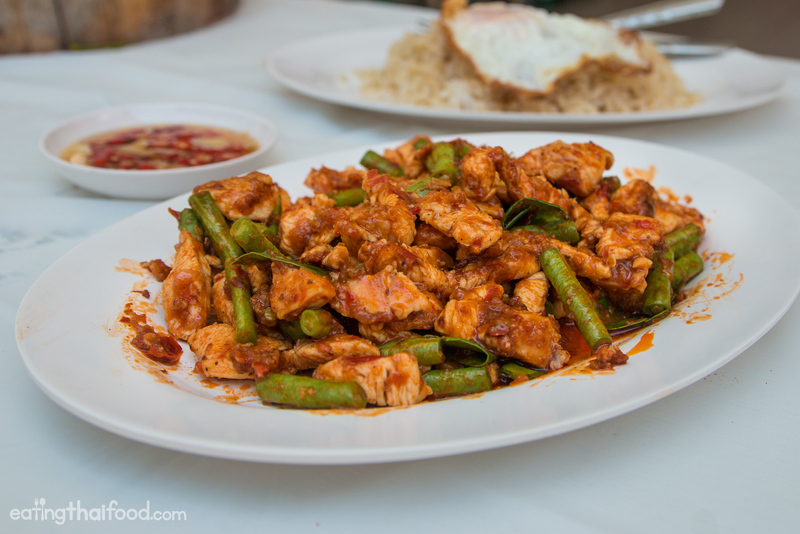 One of my go-to everyday Thai street food dishes is gai pad prik gaeng, chicken stir fried with Thai red curry paste. Once you have red curry paste (recipe below), this recipe is easy to make, and incredibly tasty. 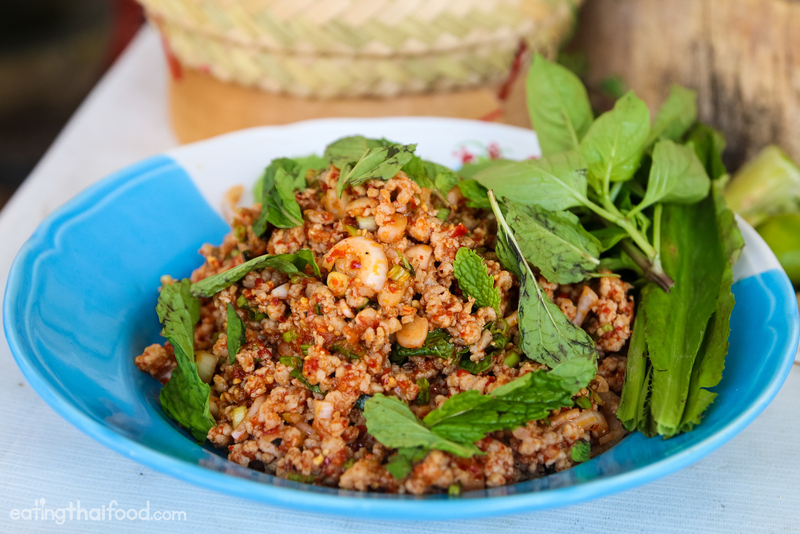 Khua kling (คั่วกลิ้ง) is a favorite dish for many local Thais from the south of Thailand. It’s basically a dry meat curry, and for this recipe I’ve used pork, buy you can really use any kind of minced meat that you like – beef, chicken, or even lamb would taste food. For khua kling you need to first have southern Thai curry paste, and once you have the paste, all you have to do is stir fry the meat with the curry paste – it’s simple and tastes delicious. 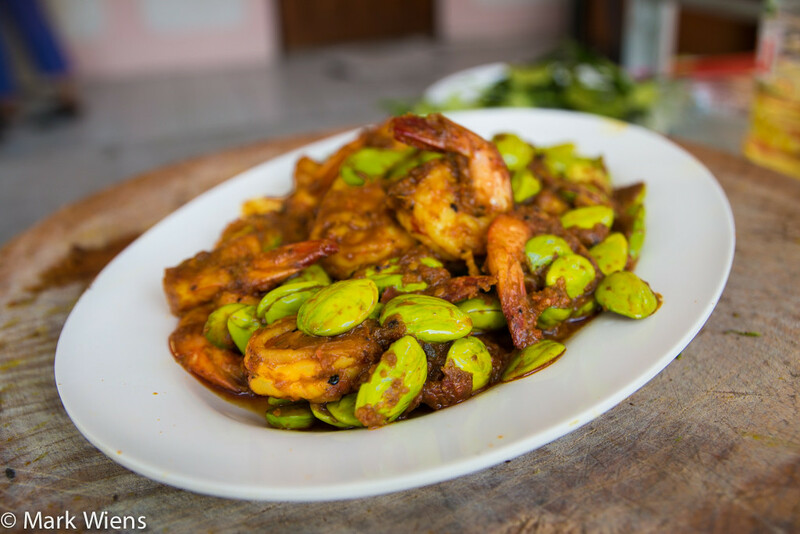 Stink beans, also known as petai (in Malaysia) is one of my favorite ingredients in the world. 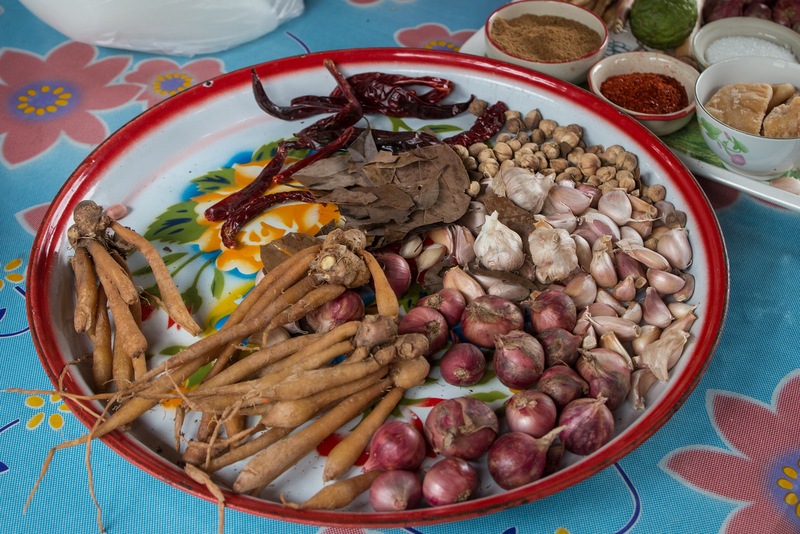 It’s a strong flavored bean from a twisted pod and it can be eaten in many different ways, from raw to stir fried. Sataw (สะตอ), stink beans in Thai, are available throughout Thailand, but they are most popular and common in southern Thailand. This recipes is for stink beans stir fried with yellow curry paste and shrimp, and it’s one of my undisputed favorite Thai dishes. After eating this amazing dish at a restaurant on the outskirts of Bangkok, I was inspired to make this dish on my own back at home. 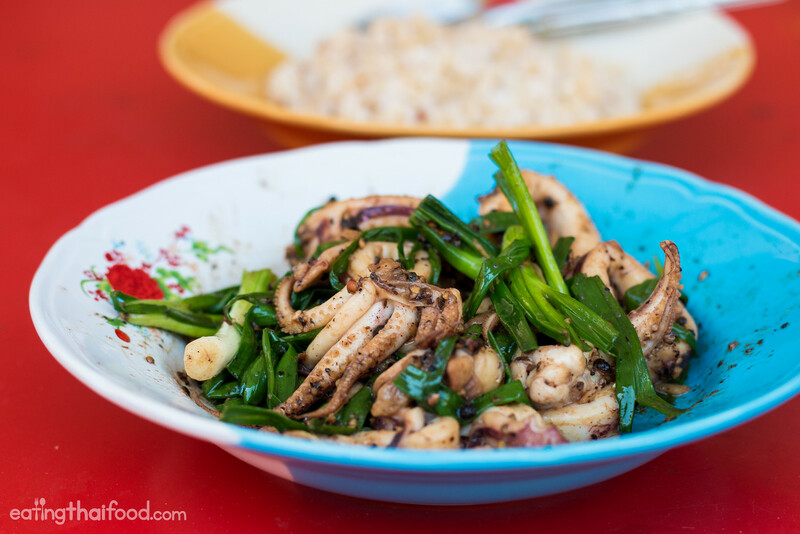 You could make this recipes with a choice of different seafood, but typically in Thailand it’s made with squid which is sliced up and stir fried with black pepper, garlic, and lots of green onions. If you love squid and black pepper, you’re going to love this. 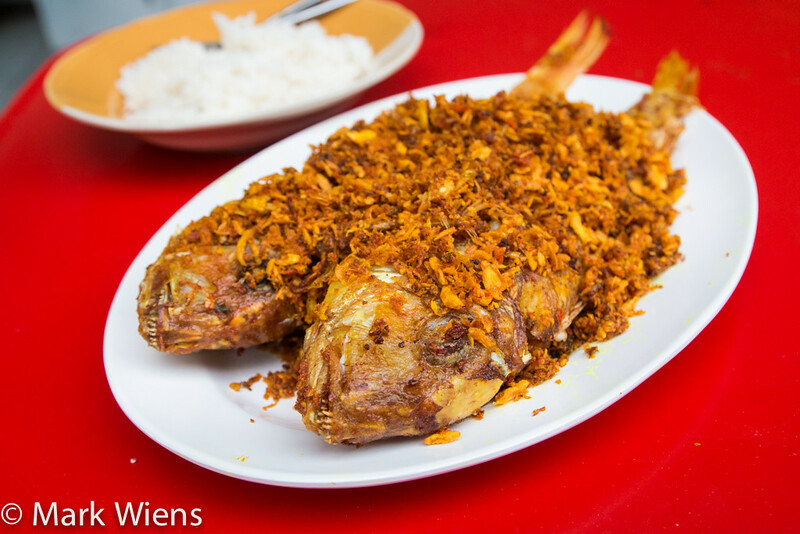 Thai fish deep fried with garlic and turmeric is one of the popular ways to cook and eat a fish in the south of Thailand. This recipe is really quite easy, and as long as you can get your hands on some fresh fish, lots of garlic and fresh turmeric, you’ll be set. It’s a simple dish, but the flavors are amazing. 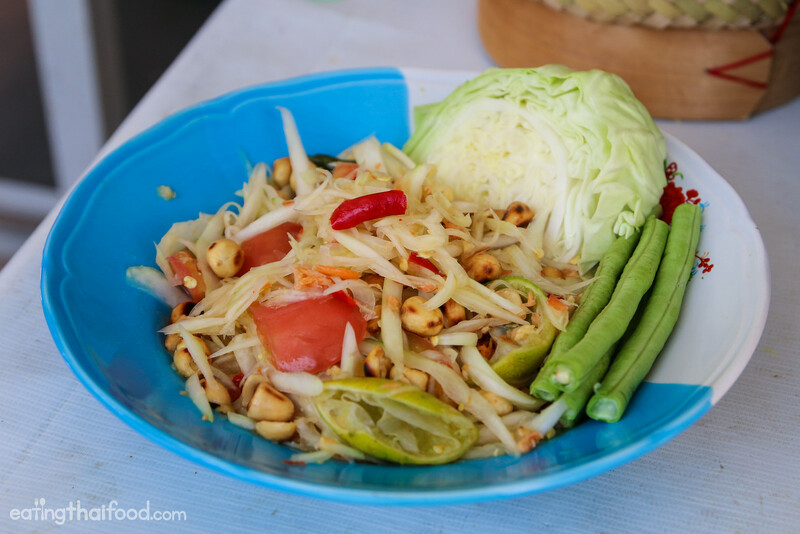 Better known as som tam, green papaya salad is a staple of Isaan food. The green papaya is shredded, mixed with a few other vegetables, and dressed in lime juice, palm sugar, and fish sauce. It’s often eaten with sticky rice. 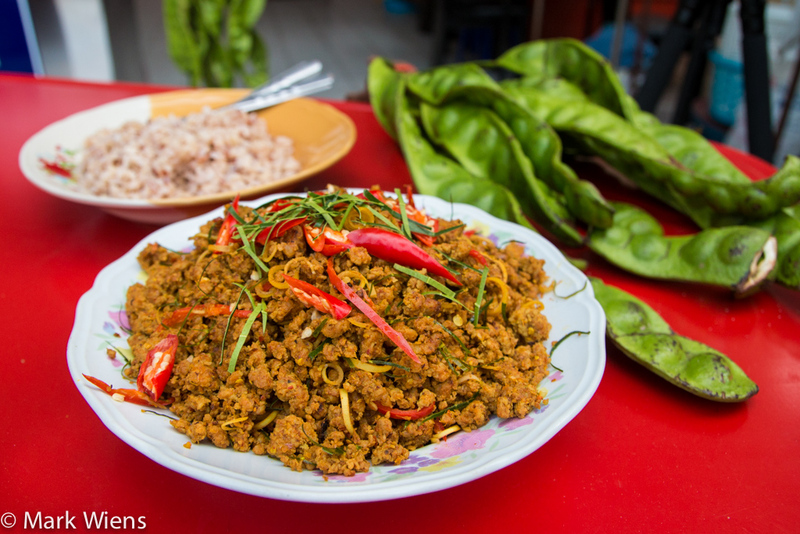 Larb is a meat salad, often made from minced pork, but can also be made from minced chicken, duck, or fish, which is cooked and mixed with fish sauce, lime juice, toasted sticky rice, and seasoned with chili flakes and herbs. It’s a dish very common in northeastern Thailand and Laos, and it’s a favorite dish to be eaten along with som tam (green papaya salad) and sticky rice. The literal translation of nam tok neua (น้ำตกเนื้อ) is waterfall beef, but in reality it’s a Thai Isaan style grilled beef salad. For this dish, you first marinate the steak (of you could alternatively use pork or another meat of choice), then slice it into bite sized pieces, and finally mix it with a dressing that includes lime juice, fish sauce, chili flakes, and plenty of flavorful herbs. This is a relatively easy Thai dish to make, and it tastes incredibly delicious. 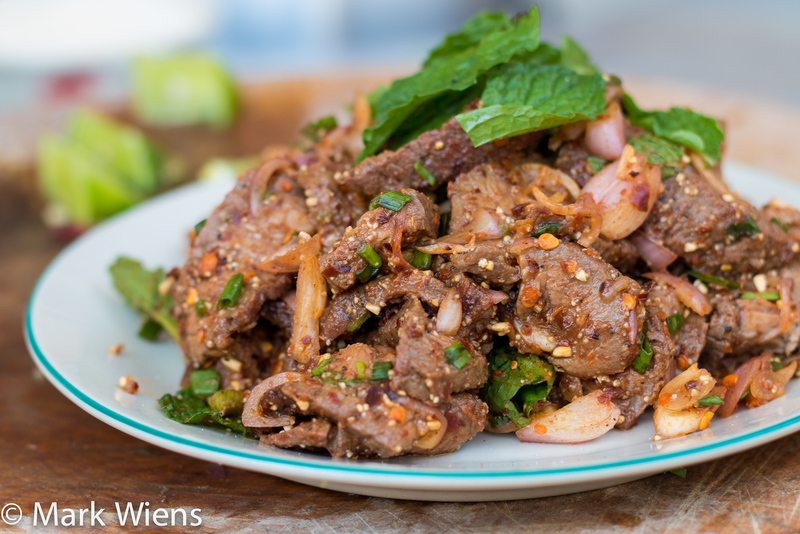 Nam tok is very similar to larb, but instead of using minced meat, it typically used grilled meat. 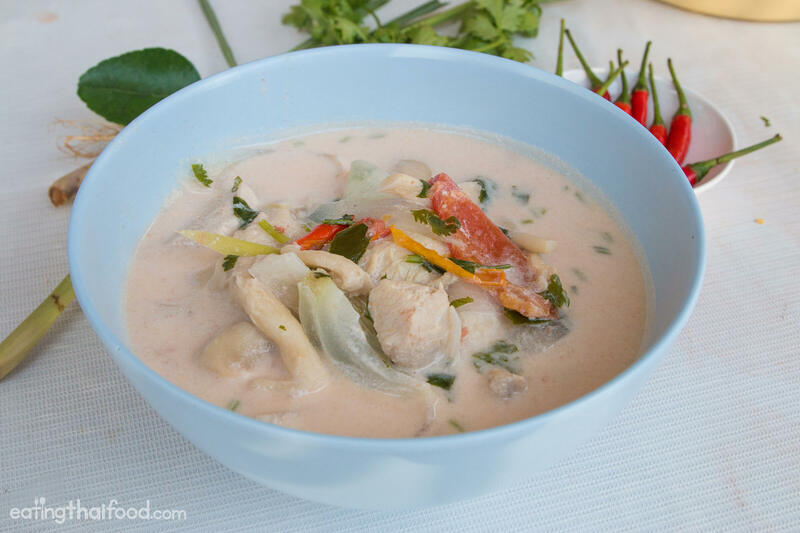 Tom kha gai (ต้มข่าไก่) is a popular Thai soup or curry, made with coconut milk and chicken, and flavored with lemongrass, galangal, and chilies. It is usually quite mild in spice, and really focuses on the delicious richness of the coconut milk. Tom yum goong (ต้มยำกุ้ง) is one of the national dishes of Thailand, a soup made with shrimp, and a broth flavored with the holy trio of lemongrass, galangal, and kaffir lime leaves. 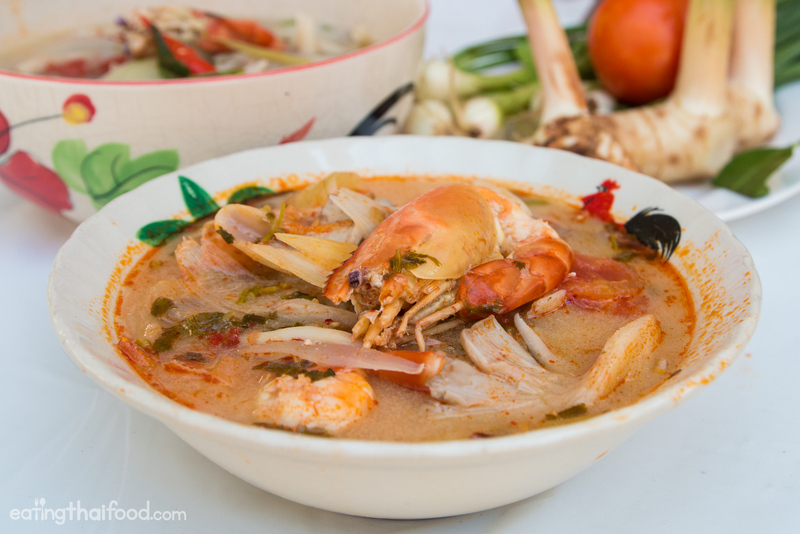 There are about a thousand different recipes and variations of tom yum soup in Thailand, and this one is more of the modern street food style. Soon, I’ll be trying to make some more traditional recipes for tom yum goong (ต้มยำกุ้ง) – so stay tuned for those as well. Gaeng som (แกงส้ม) in Thai translates to sour curry, and it’s popular in a variety of different versions throughout Thailand. The central Thai version of this dish is more like a sweet and sour soup, but the southern Thai version, which is the one we’ll be making in this recipe is very sour and very spicy, and orange from lots of fresh turmeric. It’s easy to make, and it tastes delicious. It’s one of my favorite Thai dishes that I eat at home very often, and it’s very healthy as well. 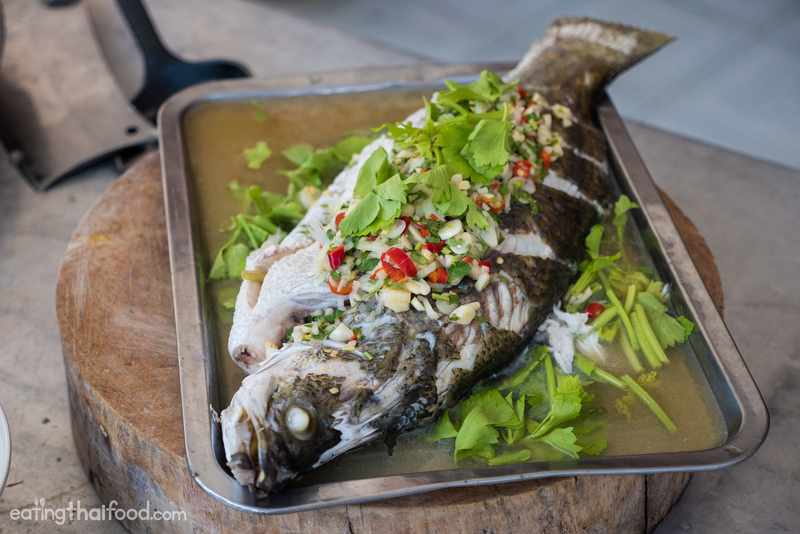 One of my favorite ways to cook a whole fish is the Thai way! It’s first stuffed with lemongrass and kaffir lime leaves, then coated in a thick layer of salt crust, grilled to perfection, and finally served with a spicy garlicky dipping sauce on the side. If you love fish, you’ll love this recipe. 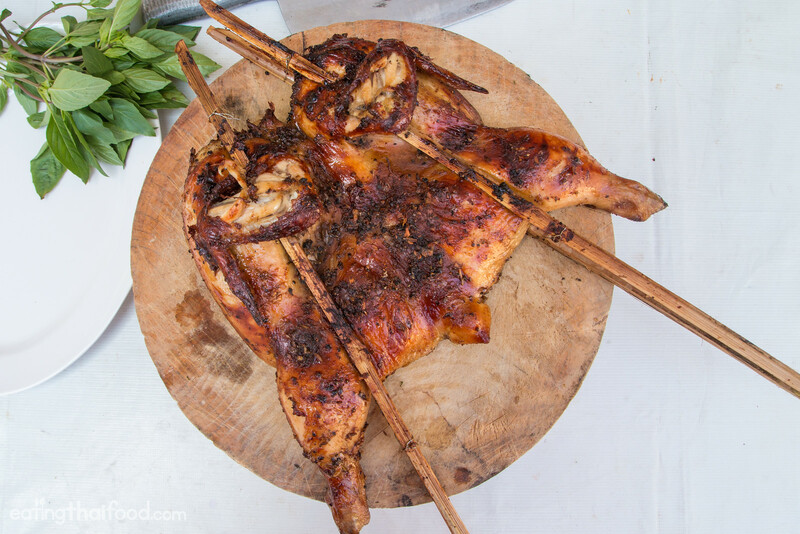 Known as Gai Yang (ไก่ย่าง) in Thai, grilled chicken is very common throughout the country. Usually the whole chicken is first marinated in a combination of garlic, coriander roots, black pepper, palm sugar, and soy sauce, and then grilled to perfection. If you love grilled chicken, you’ll love this recipe. Years ago when I first visited northern Thailand I noticed these little banana leaf packets, but I had no idea what they were filled with – all I knew is that they were roasted over charcoal. 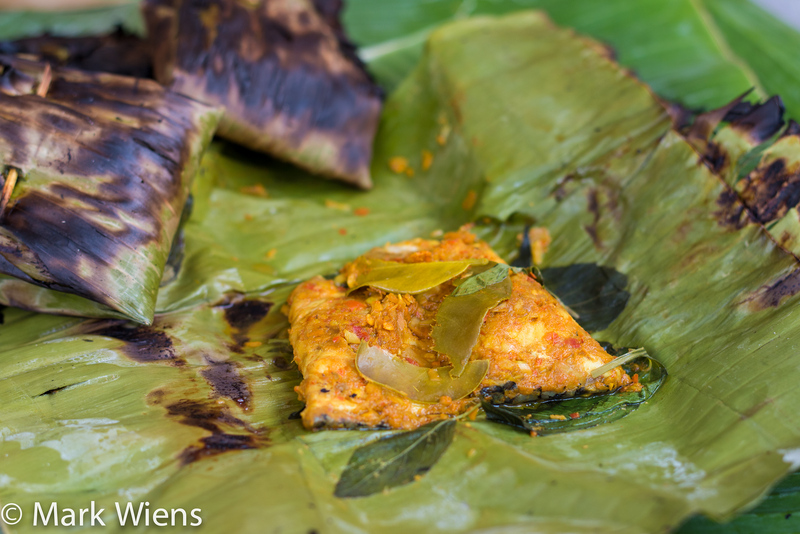 I soon figured out they were called aeb (แอ๊บ), and include a mixture of either meat or fish, mixed with lots of spices and herbs, wrapped up into a banana leaf, and then grilled over charcoal. Using banana leaves, this Thai recipes for aeb pla nin (แอ๊บปลานิล), which is made with tilapia, is kind of like grilling and steaming and baking all at the same time. All the earthy tastes of the herbs and spices seap into the fish beautifully. This is one of my favorite Thai street food recipes to cook. Khanom jeen nam ya (ขนมจีนน้ำยา) is the combination of a minced fish and coconut milk curry, eaten with soft rice noodles known as khanom jeen. This dish is most well known as being from the south of Thailand, where you’ll find it available especially at local morning markets. As far as cooking Thai curries, this is a very simple recipes, and it doesn’t take very long to prepare. 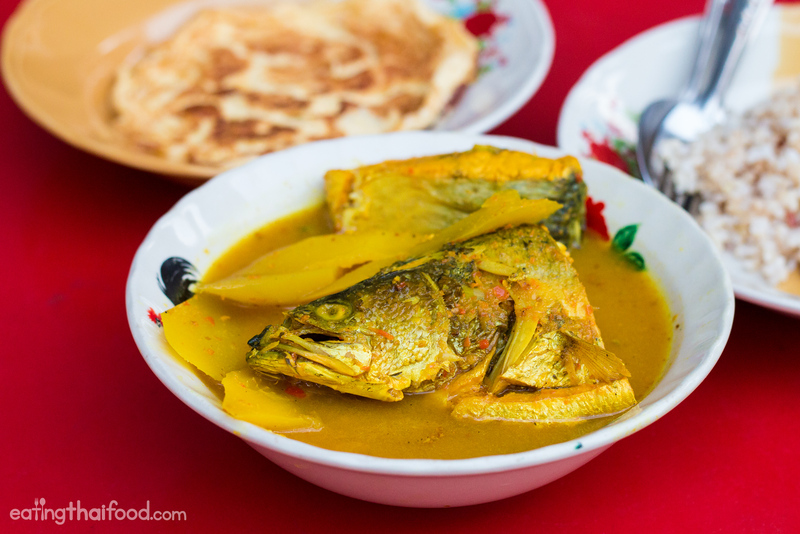 All you have to do is boil and debone fish, pound a simple curry paste of turmeric, chilies, garlic, and lemongrass, and mix it all with fresh coconut milk. This is one of the Thai recipes on this list that comes directly from my mother in law who cooks it frequently. 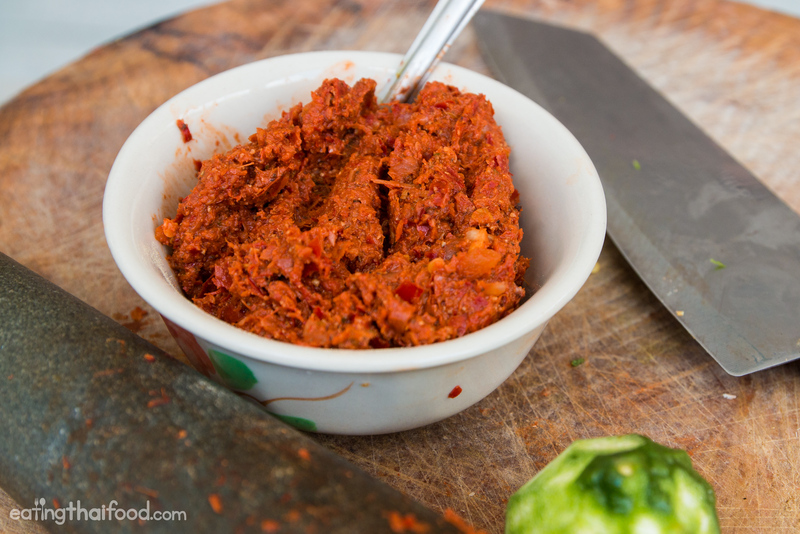 Thai red curry paste recipe (พริกแกงเผ็ด) is a blend of dry red chilies, lemongrass, kaffir lime, galangal, and a variety of other fragrant ingredients. You can use Thai red curry in a variety of different Thai dishes, including gai pad prik gaeng (chicken stir fried with red curry paste). This Thai curry paste is similar to red curry paste, but one of the key ingredient differences is the fresh turmeric. Turmeric is frequently used in southern Thai cooking, giving many of the dishes their orange color. 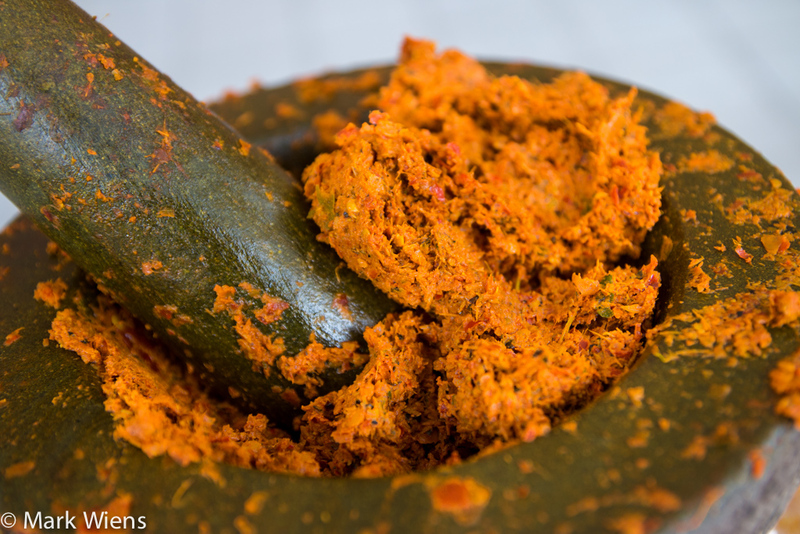 Southern Thai curry paste is used for making curries, and can also be used in stir fried dishes as well. Since my wife and her family are from the south of Thailand, I get to eat a lot of southern Thai curry paste, and it’s one of my favorite versions. One of the most popular Thai seafood dishes is pla kapong neung manao (ปลากะพงนึ่งมะนาว), a steamed barramundi, covered in a sour lime juice sauce and filled with garlic and chilies. When i go to eat at a restaurant in Thailand, this is one of the dishes I often order, and the good news is, it’s pretty easy to cook yourself as well. 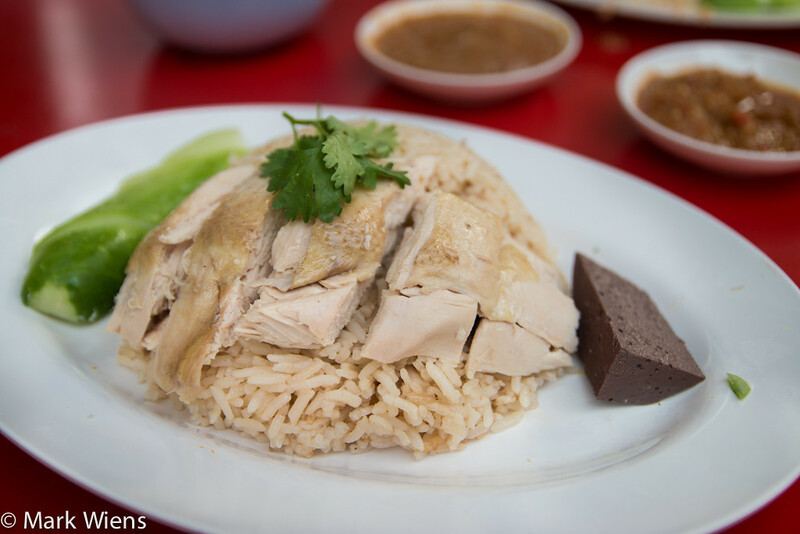 Khao man gai (ข้าวมันไก่) is the name for the Thai version of the well-known dish of Hainanese chicken and rice. The chicken is boiled and served along with rice cooked in garlic and chicken stock, a sauce, and a side chicken soup. I had a lot of fun making this recipe, and especially serving it the Thai street food way (so make sure you watch the video to see the full street food adventure)! 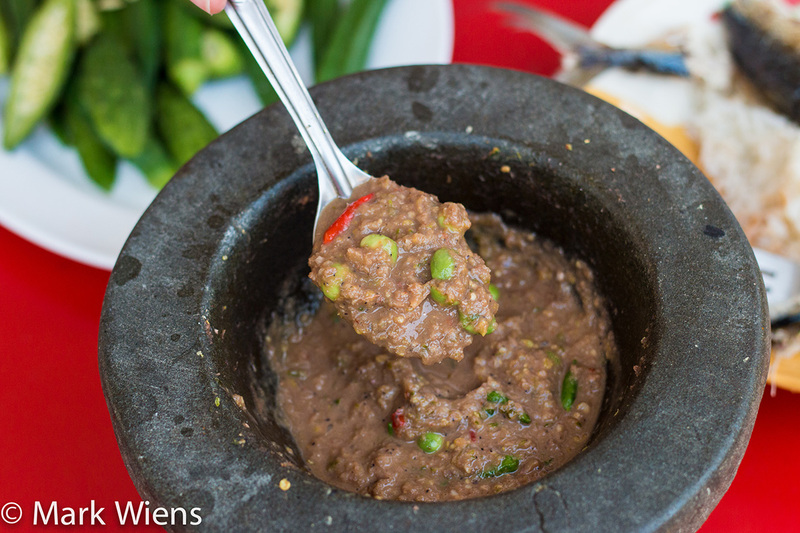 Easily the most famous and widely consumed Thai nam prik, or chili sauce condiment, is nam prik kapi (น้ำพริกกะปิ), a version made with fermented shrimp paste (kapi กะปิ), chilies, garlic, and lots of lime juice. 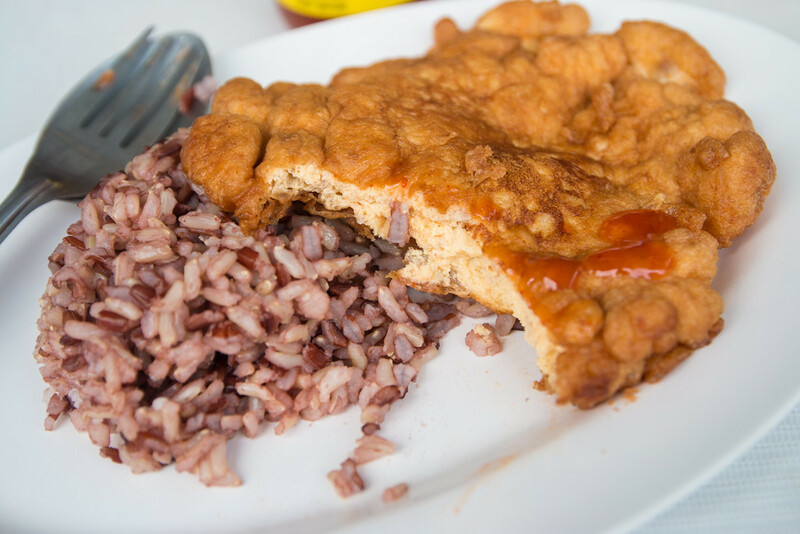 The chili sauce is typically eaten along with boiled or raw vegetables, fried or grilled fish, and a plate of rice. This recipe is easy to make, and it tastes incredible. 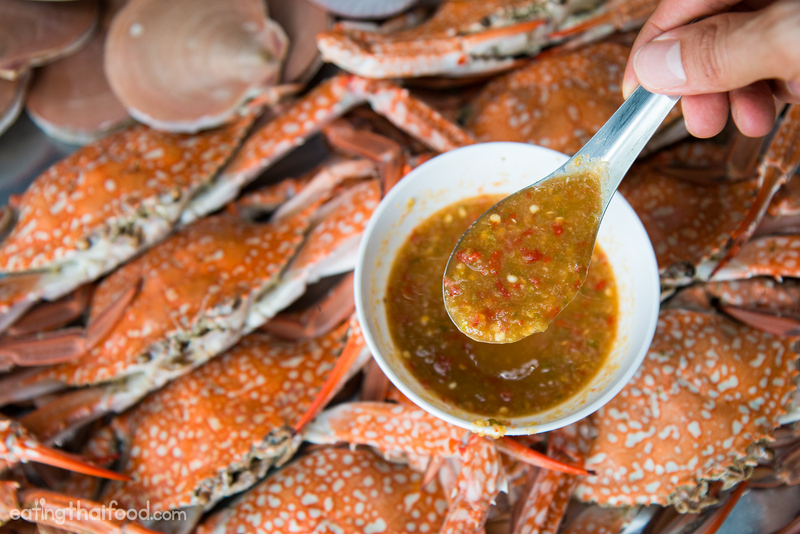 Thai seafood sauce, known in Thai as nam jim seafood (น้ำจิ้มซีฟู้ด) is typically a combination of garlic, chilies, fish sauce (or just water), salt, lime juice, and sugar to taste. Depending on your preference you can make it more or less sweet, or more or less spicy. Thai seafood sauce is normally eaten along with either grilled, boiled, or steamed seafood. 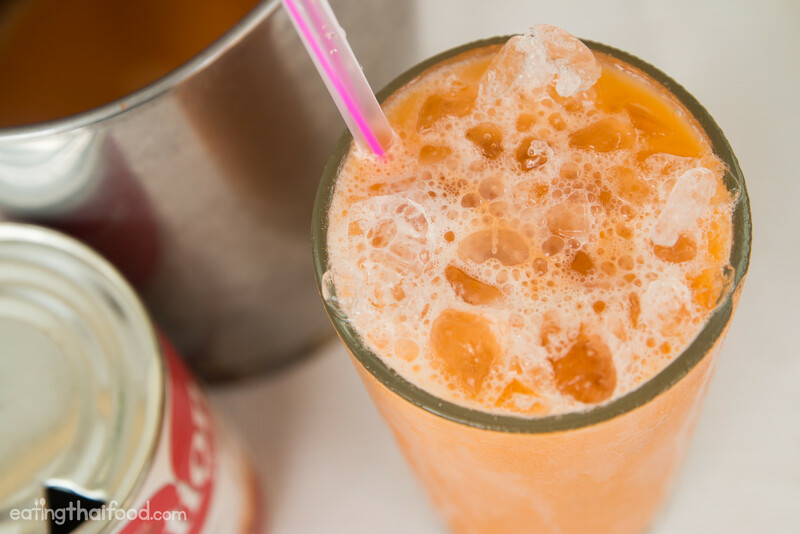 Walk down the street in a city in Thailand and you can’t go more than a few steps without bumping into a drinks stall decorated with Carnation milk cans that sells Thai iced tea. It’s served sweet and creamy, and almost always over a cup of ice. Here’s our authentic street food style recipe. 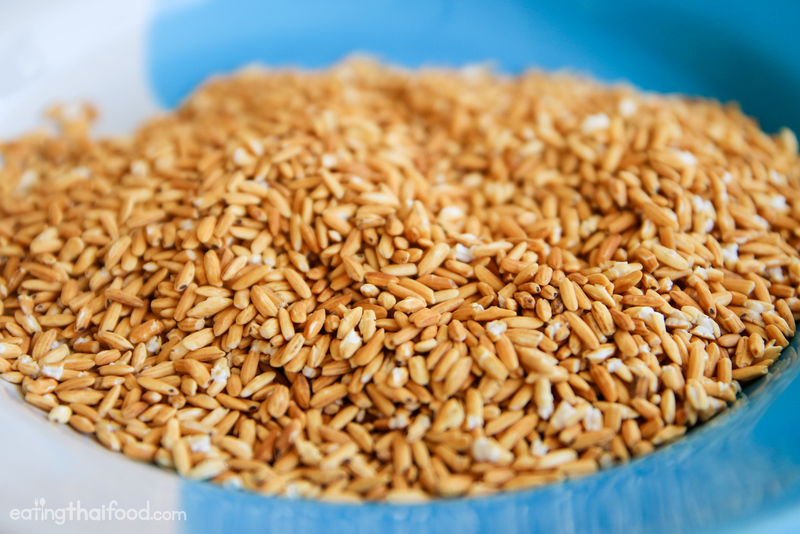 Khao neow (วิธีทำ ข้าวเหนียว) or Thai sticky rice, is the traditional staple in northeastern and northern parts of Thailand. Instead of boiling sticky rice (like normal rice would be prepared), sticky rice is instead prepared by soaking it in water overnight or for at least 6 hours, and then steaming it in a basket for about 15 minutes. 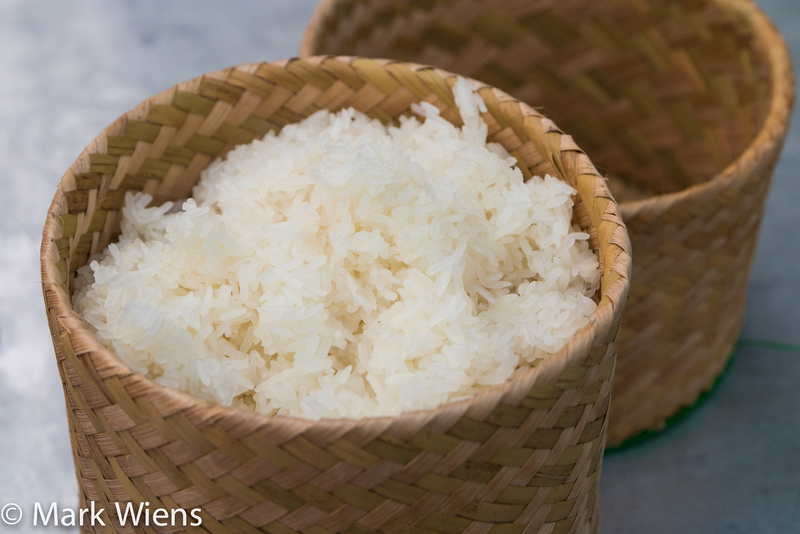 If you follow these simple steps, you’ll be able to make authentic Thai sticky rice that should hopefully turn out soft and fluffy. One of the important ingredients in Isaan (northeastern) Thai food is khao khua (ข้าวคั่ว), which is toasted sticky rice powder. The uncooked sticky rice is dry roasted until it turns yellow golden and fragrant, then it’s pounded into a coarse powder. 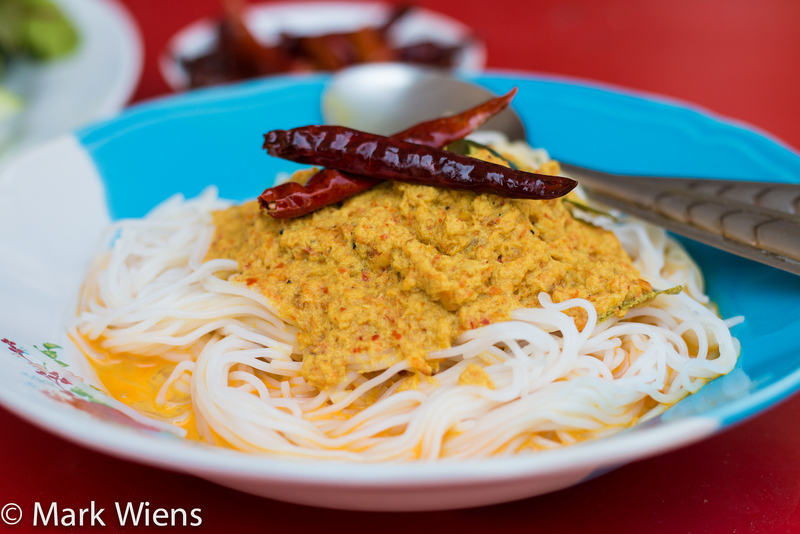 This is extremely easy to make, and it tastes very good is some Isaan dishes like laab and nam tok. Want more authentic Thai food?